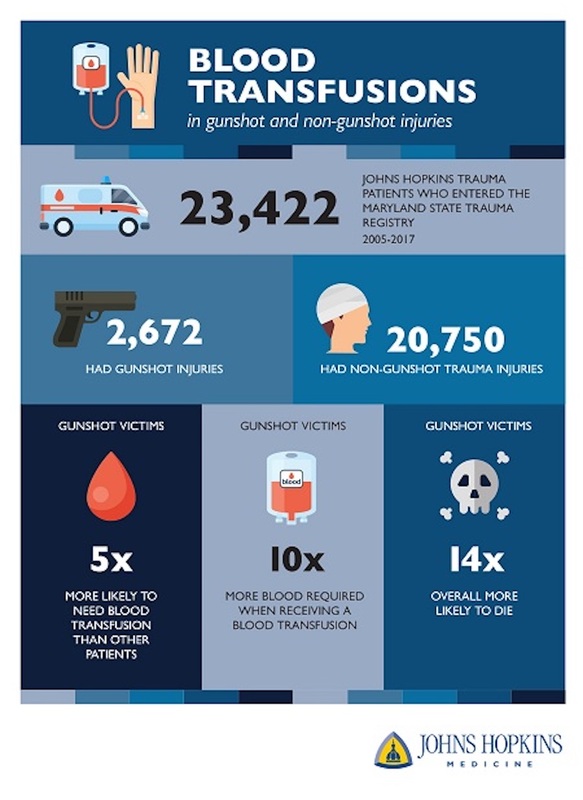 In a new analysis of data submitted to Maryland’s state trauma registry from 2005 to 2017, Johns Hopkins Medicine researchers found that gunshot victims are approximately five times more likely to require blood transfusions, they require 10 times more blood units and are 14 times more likely to die than people seriously injured by motor vehicles, non-gun assaults, falls or stabs. 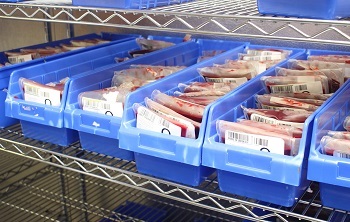 “Blood products cost a lot, come with a lot of risks for those transfused, and are scarce, so understanding what kinds of trauma are most likely to require more of them can help hospitals improve outcomes for trauma victims,” says Steven Frank, M.D., professor of anesthesiology and critical care medicine at The Johns Hopkins University and the study’s corresponding author. The average age for GSW patients was 27 and the average for non-GSW patients was 38. Males made up the majority of both types of patients — 2,497 of 2,672 (93.45 percent) GSW patients and 13,954 of 20,750 (67.3 percent) of non-GSW patients were male. (3.3 units versus 0.31 units for non-GSW patients). “The most likely explanation for these findings is the dramatic degree of injury severity in gunshot victims compared to all other types of trauma, including stab wounds,” says Frank. The Johns Hopkins Hospital blood bank is always ready to activate a mass transfusion protocol for patients who need large amounts of blood. “For emergency preparedness purposes, hospitals that treat trauma need to have a sufficient amount of blood in the bank in order to treat patients coming in with gunshot wounds,” says Frank. COI: Steven Frank has been on advisory boards for Haemonetics and Medtronic. Paul Ness has consulted for New Health Science and Terumo BCT.